What Hi-Fi? Awards 2016 issue on sale now! | What Hi-Fi? What Hi-Fi? Awards 2016 issue on sale now! The What Hi-Fi? Awards issue is on sale now! With 102 winners in 27 categories, from amplifiers to record decks, TVs to wireless speakers, we've picked the crème de la crème. Each category has Best Buys at a range of prices to suit your wallet, as well as our coveted Product of the Year Award. You're not going to want to miss this. 2016 has been a year of change. Headphone jacks have been shunned, turntables have made a comeback, the Internet of Things is starting to make us even more connected to our tech and – probably most importantly - we got a new office space. But some things are immutable; the What Hi-Fi? testing rooms, despite having moved venue, remain a steadfast trial chamber for hi-fi big or small. From old favourites like speakers, amplifiers, TVs and headphones, to emerging categories such as soundbases, streamers and multi-room systems, we’ve reviewed them all and celebrated the best at our annual Awards ceremony. If you need an excuse to start Christmas shopping, this is it. There is a veritable smorgasbord of frontrunners this year. Some companies have kept their place on the podiums, but we’ve also seen some new names displacing well-established Award winners. You can find all the winners on our dedicated Awards 2016 site (as well as previous years' winners) and you can rest assured that all the products featured offer the very best performance-per-pound value in their respective categories. Of course, it’s not all about the Awards. There are still a number of new products entering the First Tests section ready to make their mark. Starting the proceedings is the newest addition to Apple’s smartphone repertoire. The iPhone 7 jack-less design caused a stir the moment that the initial rumours began to fly. However, Apple’s most controversial move has certainly paid off, earning it the full five stars from us. There are also reviews of Oppo's latest DAC, the Xbox One S, and some new AKG in-ear headphones. It’s a Denon and Yamaha double-whammy this year, with the former taking the affordable end of the market by storm and the latter leading the high-end. Denon’s AVR X2300W wins our Product of the Year Award, the upgrade to the X2200W replacing it in this category. Yamaha’s RX-A3060 makes its mark at £2000 for its versatility and talent, while packing a lot of features into a slick design. While our hearts will always belong to our own What Hi-Fi? branded turntable that celebrated our 40th anniversary, Rega’s Planar 3 is a powerful Product of the Year. The company makes a second appearance with its sub-£500 Planar 1, while the Clearaudio Concept retains its place in our pages for another year. 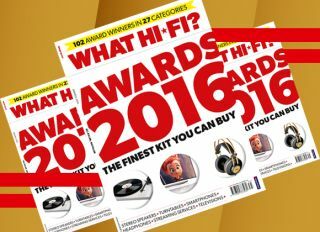 Special mention goes to the Audio Technica AT-LP5 as the best USB turntable – a new category for the 2016 Awards. Plug-and-play is always an attractive feature, and the company pulled it off well. Cutting cables while keeping sound quality is the name of the game, and the Dali Katch wins our Product of the Year title for managing to do just that. The size of the sound is incredible for its stature, and one that’s well worth its price. Among the six other winners are the UE Roll 2, displacing the UE Roll we praised last year. Audio Pro’s Addon T3 keeps its place, as does Monitor Audio’s Airstream S150. Geneva’s AeroSphère comes in twice, as both its small and large versions take away an Award each, and the Naim Mu-so sits at the top of the tree. Remember, you can subscribe in print or online, or buy individual digital and print copies of the magazine online. See here for full details. The What Hi-Fi? Awards 2016 issue of the magazine is on sale now.